PZ360 shortlisted for property awards. PZ360 has been included on the shortlist for the Michelmores and Western Morning News Property Awards. The awards are the region’s premier property competition, showcasing the very best in Westcountry property projects, buildings and firms. Among the contenders for the prestigious Commercial Project of the Year award is the dramatic new Sainsbury’s in Penzance. PZ360 is included in the category 2 shortlist: commercial project of the year with a value under £5million, sponsored by Torbay Development Agency. The winners will announced on May 8 2014 at an awards ceremony to be held at St Mellion Golf and Country Club in Saltash, Cornwall. 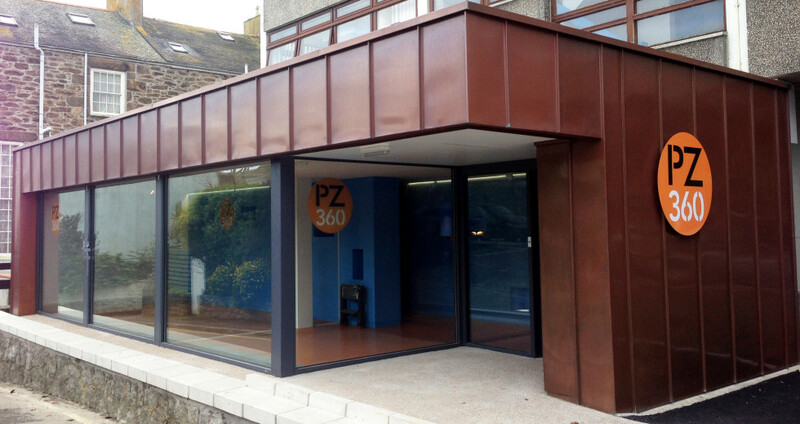 The new entrance for PZ360. Work at PZ360 is coming to a close. The entrance foyer has been completed and a new access system, complete with video intercom access. The lift has been refurbished with a landscape of the Merry Maidens on the three lift walls.